Generally I think that the cars in Heartbeat are great. They are clearly from the era and are just the sort of cars you would expect to see on the roads in the sixties. 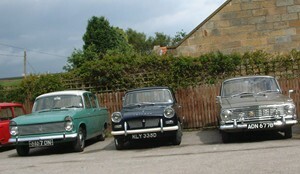 These three (from left to right), a Hillman Super Minx, a Triumph Herald and a Vauxhall Victor, are very typical motors from the late sixties. They would have all done quite a few miles by 1969, but were still going strong. I like Oscar Blaketon's Morris Traveller too and Gina's Beetle - though I might have put her in a Mini (car that is!). Peggy Armstrong's battered Austin 16 seems just perfect for the character. This is just the type of vehicle you would have seen on the roads in the early sixties in this sort of condition. It's true that the MOT or Ten Year Test, as it was known, condemned many of these cars to the scrap yard by 1969, but perhaps we can assume Bernie Scripps keeps it going for her at discounted rates? I do take the odd exception to some of the vehicles though. I did not particularly like the choice of a Jaguar 420 G for Matthew Trent (Dr Helen Trent's now ex-husband), for example. Yes it's a lovely car. Yes, it's the kind of car a businessman of the sixties would have chosen, but for a much older man than Matthew Trent (who is presumably meant to be in his mid-30s). If you remember the "Rise and Fall of Reginald Perrin" from the 70s, Reggie's Boss, CJ, drove one of these. A Jag was probably right for Matthew Trent, but I'd have put him in an XJ6, which was a brand new model in 1968. Another choice of car I didn't particularly care for was the Ford Zephyr, (or was it a Zodiac Convertible?) owned by a prominent race horse trainer's wife in a recent episode. It was oldish - at least seven years' old in 1969 and it had alloy wheels. I'd have thought this sort of car would have been more likely to have been owned by a boy racer from the back streets of Whitby. I'd have chosen, a Mini may be, or even an MGB GT, as a more suitable vehicle for her. The Ford would have been an eccentric choice!